I was recently tasked with creating an eConnect integration between Microsoft Dynamics GP 10 and a custom SharePoint 2010 Portal designed to replace the GP Item Maintenance process with workflow and departmental routing. Most of the eConnect examples I see online serialize the eConnect object to a file before loading it into an XmlDocument. This can cause unnecessary permissions concerns, and worse, if your application runs under the context of IIS or SharePoint you may not have a file system available to you at all. This was the case in my scenario. A much better approach is to serialize the object in memory. I'm posting this for my own reference because I can never remember the full syntax and I regularly have to look it up. I think I've seen at least 3 or 4 different code samples showing how to serialize eConnect XML in .NET. One version, which I think is actually based on sample eConnect code that Microsoft provided years ago, writes the XML out to a file on the hard drive, then reads it back into memory. The first time I saw this my eyes rolled in disbelief. Clearly that is a terrible idea and is completely unnecessary. There are several new methods added to this class and they are discussed in the eConnect Programmers guide in MSDN here. These methods provide the functionality for reading and writing to the Dynamics GP databases. One of the more interesting changes is that the CreateTransactionEntity method returns a string value. This string is the XML that is passed to the eConnect API and it includes the generated Document Number of the transaction. So if you are integrating Sales Transactions and do not pass the SOPNUMBE value in the XML, the eConnect API retrieves the next number internally and you will then be able to see the SOPNUMBE in the string value returned by the CreateTransactionEntity method. The CreateEntity, CreateTransactionEntity, DeleteEntity, DeleteTransactionEntity, UpdateEntity, and UpdateTransactionEntity may have different names but they all go down the same road. In other words, right now they have been named this way for readability but have no real big differences. For instance, it is possible to create a GL Transaction by passing a GL Transaction Type XML document to the DeleteEntity method. The only difference between these methods is that the CreateTransactionEntity returns a string and the others return a bool! An advantage to having different naming conventions would be for readability of your code. If you have an application that does multiple operations like creating new transactions, updating existing customers, and deleting addresses, you could pass the specific XML documents to the desired methods so the code would be easier to understand from a developer perspective. For example, you would pass your XML document that updates a customer record to the UpdateEntity method and you would pass a new Sales Invoice transaction XML document to the CreateTransactionEntity method. You can bypass using the new eConnect Windows service so your application calls the eConnect stored procedures under the context of the user running the application. Thus the eConnect service does not even need to be running and the user(s) running the application will need to have access in SQL server. You can give them DYNGRP role access or something more granular like spefic access to eConnect stored procedures and tables. You can take advantage of this option in a couple ways where you will set the RequireProxyService configuration property to false. The default value for this setting is true so by default the eConnect service needs to be running. If it is not, you will receive a "There was no endpoint listening at net.pipe://localhost/Microsoft/Dynamics/GP/eConnect/EntityOperations that could accept the message" error when the eConnect API attempts to intialize the service proxy. An interesting related tidbit is that the Web Services for Microsoft Dynamics GP 2010 takes advantage of this setting. If you have the Microsoft Dynamics GP Web Services installed, take a peek at the WSServiceAppSettings.config file under the C:\Program Files\Microsoft Dynamics\GPWebServices\ServiceConfigs folder. You will see a line at the bottom of the file that sets the RequireProxyService to false. You can even go ahead and stop the eConnect Integration Service and attempt a call to a method in the Microsoft Dynamics GP 2010 Web Services and it will be successful. Go ahead I know you want to try! The web services call will be successful because the eConnect service proxy is bypassed and the call to the eConnect SQL objects is made under the context of the user running the Microsoft Dynamics GP Service Host service that is used by the Microsoft Dynamics GP 2010 Web Services. I recently fielded a question on the GP Developer newsgroup about an eConnect error that occurred when trying to import inventory adjustments with multi-bin. After poking around in the GP Item Transaction Entry window, I found the inconsistency that was causing the problem. The Item Transaction Entry window is one of the few places in GP where you can enter a negative quantity. I admit that I truly enjoy being able to type a negative number in the Quantity field, since it's such a rare treat in GP. There was no endpoint listening at net.pipe://localhost/Microsoft/Dynamics/GP/eConnect/EntityOperations that could accept the message. This is often caused by an incorrect address or SOAP action. See InnerException, if present, for more details. There are probably several possible causes of this error, but one of the simple causes is that the eConnect 2010 Integration Service is not running on your server. The eConnect Programmer's guide discusses creating a custom XML node and stored procedure so developers can process new types of data. 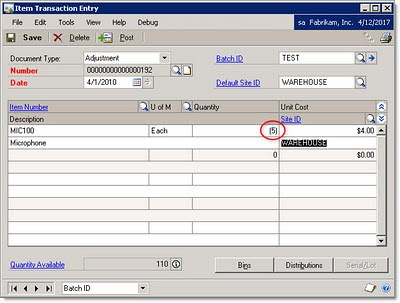 For example, a custom or 3rd party table could be updated when integrating a master record like a Customer or a transaction like a Sales Invoice using eConnect. The strategy that I will discuss below is for developers out there that would like to go one step further by referencing their own custom assembly. This assembly can be referenced in their Visual Studio project which would allow them to serialize the eConnect XML document with the custom node. The question is how can we serialize a document like this in our Visual Studio project when the existing eConnect serialization assembly does not know anything about the custom node? The answer is we will create a new assembly that we can reference in the Visual Studio project. This approach allows the developer to follow the pattern of working with the types in the serialization assembly like we provide in the eConnect documentation and SDK samples. Next I used the xsd.exe tool to build a new class based on the XSD file. I used the below syntax at a command prompt in the C:\Program Files (x86)\Microsoft Visual Studio 10.0\VC directory. This is the Microsoft Visual Studio Command Prompt for Visual Studio 2010 that is available in the Microsoft Visual Studio 2010 program folder. I had a case this week that was asking a fairly commonly asked question about integrating address information using eConnect. The scenario is that we want to update a customer or vendor address and the previous address had three lines in the address and the new address only has two lines. When the update is processed, Address Lines 1 and 2 have been updated, but Address Line 3 has the old data and has not been cleared. So how can I update Address Line 3 with blank data? Let's start with a little more background information. If you develop eConnect integrations, you probably know by now that with eConnect 2010, Microsoft changed the method used to submit transactions to eConnect. With GP 10 and earlier, there was a single method called "eConnect_EntryPoint". Simple and easy, it accepted all of the eConnect document types. With GP 2010, there are now two different methods. There is now a method called "CreateEntity", and a second called "CreateTransactionEntity". Although I have one guess, I haven't asked and don't really know why this change was made, or what the rationale was behind implementing two methods--I just hope that some thought was put into it, and I hope that there was some benefit behind the scenes. I hope that because it's slightly annoying to have to make two different calls now. By no means a big deal, but just slightly annoying, especially if you are upgrading from eConnect 9 or 10. You have to review your code and make sure that your code to create customers calls CreateEntity, and your code that imports invoices calls CreateTransactionEntity. CreateEntity: Creates a record using information from an eConnect XML document. Use CreateEntity to add data entities like customers or vendors. You specify the type of record to create with a parameter that represents an eConnect XML document. If the operation succeeds, the method returns True as a boolean value. I recently upgraded a Dynamics GP Visual Studio Tools AddIn from GP 9 from GP 2010. The AddIn reviews some GP transactions, performs some calculations, and then inserts new payroll transactions using eConnect. The stored procedure 'taCreatePayrollBatchHeaderInsert' doesn't exist. In this particular case, the AddIn was inserting an entire payroll batch, but the specific stored procedure in the error could have been any eConnect procedure. I've never seen that type of error before, so I started with the obvious--I checked the SQL database to see if the procedure existed. It definitely did exist in the database. I then thought that maybe it was a permission issue, so I confirmed that the eConnect domain user was setup as a SQL Login, and that an eConnect user was properly setup for the company database. I even checked the DYNGRP role to make sure that the stored procedure was listed with EXEC permissions. I did a little research on the error, and saw a post that recommended checking the database connection string. If the database was not specified properly, and the import was somehow referencing the master database or even DYNAMICS, naturally that would cause this type of error. So I added some debugging code, but the connection string looked fine--the proper GP company database was being referenced. Dynamics GP eConnect has a "feature" called Transaction Requester that, among other things, allows it to compile a list of all records or transactions that have been inserted, updated, or deleted in Dynamics GP. eConnect Requester fundamentally consists of SQL Server database triggers that monitor changes to the Dynamics GP database tables and record any inserts, updates, or deletes that are made to that table. When the triggers detect a change, they write a record to the eConnect_Out table. If you want, you can also use the eConnect Outgoing Service, which can output XML files or send XML to a queue in MSMQ. eConnect Requester is a feature that is very valuable for integrations where Dynamics GP is the system of record and data needs to be sent from Dynamics GP to an external system. For instance, if an external system needs the ability to create purchase requisitions, you may want to automatically send all new or updated vendor records and inventory items from GP to that system so that they only need to be maintained in GP. Or if you use a third-party logistics vendor or fulfillment center, you may need to send purchase orders or sales invoices to those facilities so that they can receive and ship your products. This all sounds great, and in concept it is, but there is one significant fundamental limitation to eConnect Requester. If you look at the eConnect_Out database table, you will see that it really only tells you which table was updated, the index value (document number) for the record, and whether the record was inserted, updated, or deleted. 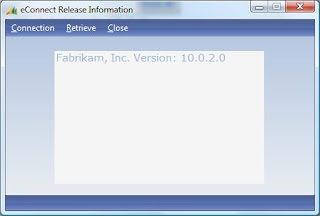 There are two methods that will allow you to retrieve the exact version and build number in eConnect 10.0. Let's say that you have developed an eConnect customer import for Dynamics GP. It works great, importing new customer records quickly and efficiently. Because customers occasionally change their address, phone number, e-mail address, or other contact information, you set your customer import to use the UpdateIfExists flag to update existing customer records. What's the catch with this technique? Well, if you are using the eConnect serialization assemblies, you will find that if you set a property to an empty string, such as rmCustomer.ADDRESS2 = "", if the existing customer already has a value for ADDRESS2 in GP, it will not be cleared from the customer record. Chris Roehrich has an excellent article on the Developing for Dynamics GP blog explaining why this happens and how to properly clear the field using the CDATA tag. Chris gives a simple example of how you might serialize your eConnect XML, and then insert a new node for the field that you want to clear out, and then set the value of that node to the CDATA[ ] value.